In vivo gene correction of the OTC locus in the mouse liver by AAV.CRISPR-SaCas9. Source: Nature Publishing Group copyright 2016. A deficiency of the enzyme ornithine transcarbamylase (OTC) in humans causes life-threatening hyperammonemic crises. The OTC gene enables the body to make an enzyme that is a critical player in the urea cycle, a process that ensures excess nitrogen is excreted by the kidneys. Left unchecked, accumulating nitrogen becomes a toxic form of ammonia. Infants with OTC deficiency can suffer their first metabolic crisis as newborns. Up to 50 percent die or sustain severe brain injury, and survivors typically need a liver transplant by age 1. Gene therapy could cure OTC deficiency, but currently used viruses, such as adeno-associated virus (AAV), are not optimal in the neonatal setting. A research team led by Children’s National Health System and the University of Pennsylvania reasoned that the newborn liver may be an ideal setting for AAV-mediated gene correction using CRISPR-Cas9 gene editing. They intravenously infused two AAVs into two-day-old mice with partial OTC deficiency. One AAV expressed Cas9 and the other expressed a guide RNA and a donor OTC DNA. This resulted in correction of the mutation in 10 percent of liver cells and increased survival in mice challenged with a high-protein diet, which normally exacerbates disease. After consuming a high-protein diet for one week, the treated newborns had a 40 percent reduction in ammonia compared with the untreated group. The correction appears to last long term. The study “provides evidence for efficacy of gene editing in neonatal onset OTC deficiency,” says Mark L. Batshaw, M.D., Physician-In-Chief and Chief Academic Officer at Children’s National, and a study co-author. “This study provides convincing evidence for efficacy of in vivo genome editing in an authentic animal model of a lethal human metabolic disease,” the research team concludes. Q: More than 400 mutations can cause OTC deficiency, and each would require a separate gene-editing approach. Is it possible instead to insert the OTC genome using CRISPR-Cas9 to correct the disorder irrespective of the mutation? Q: Will such gene editing also work in adult animal models of the OTC disorder? Q: Do these encouraging results in animals translate to efficacy in infants? Source: Yang, Y., L. Wang, P. Bell, D. McMenamin, Z. He, J. White, H. Yu, C. Xu, H. Morizono, K. Musunuru, M.L. Batshaw and J.M. Wilson. “A dual AAV system enables the Cas9-mediated correction of a metabolic liver disease in newborn mice.” Published Feb. 1, 2016 by Nature Biotechnology. Think of the urea cycle as a river. 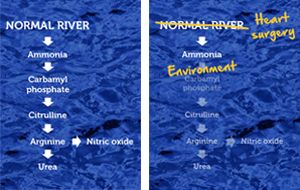 A normal river flows to where it empties, similar to the process the body uses to rid itself of harmful ammonia via the urea cycle. I recently presented at Spotlight Health 2016, the health-focused portion of the Aspen Ideas Festival, about how studying and treating rare diseases can inform innovative treatment approaches for more common medical conditions. Our Division of Genetics and Metabolism sees more than 8,000 patients a year with rare conditions, such as urea cycle disorders and Down syndrome. Through decades of analyzing these diseases and treating children who have them, we have developed therapies that apply not only for the small numbers of patients who have rare diseases but also for more common conditions caused by environmental factors leading to a similar physical response. For instance, we’ve demonstrated that the stress of cardiopulmonary bypass during surgery to correct congenital heart disease creates conditions similar to a critical blockage in the urea cycle, specifically the biochemical creation of citrulline, a key biochemical. 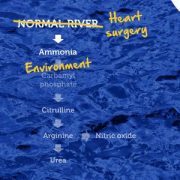 When that cycle is unable to flow, or continuing the river analogy, becomes dammed up due to a genetic defect, as in urea cycle disorders, or an environmental factor, such as the extreme stress of cardiopulmonary bypass, the body is unable to make enough citrulline which is critical for maintaining normal blood pressure. We’ve shown that replacing that citrulline can correct a lot of these problems whether caused by rare genetics or the cardiac OR. Applying rare disease treatment approaches to more common diseases is not limited to urea cycle disorders. Work by my colleague Carlos Ferreira, MD, demonstrates how a rare genetic calcifying arterial disease (generalized arterial calcification in infancy, GACI) causes the same calcium buildup and blockages as chronic kidney disease. Dr. Ferreira hypothesizes that life-saving drugs developed for use in GACI could help patients with long-term kidney disease by averting organ damage and eventual failure caused by the buildup of calcium crystals. The more we learn about these rare diseases, the more we come to appreciate the tremendous implications our findings have for patients with the rare disorders and potentially hundreds of thousands of others. Research interests: The interactions between common genetic variations and the environment.